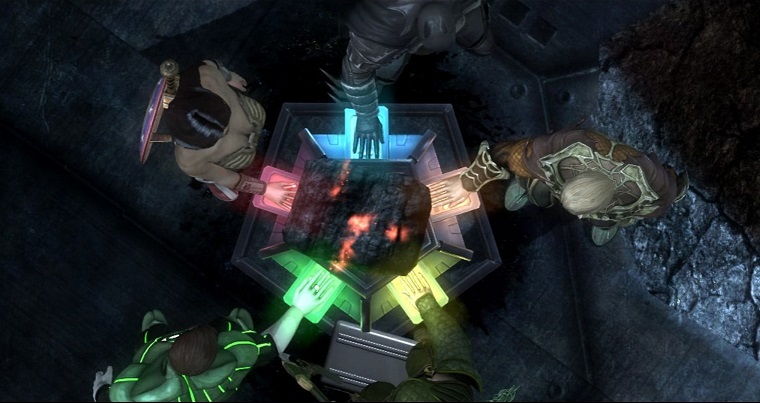 Injustice: Gods Among Us: Why’re You Hitting Yourself? There are so many games to play, and so little time. I spend a lot of that time simply staring at my gaming wall of shame, trying to decide what to play next. Sometimes, I’ll cheat by watching the YouTube videos of cinematic scenes, but when I started watching the video for Injustice: Gods Among Us, I realized that this was not merely the fighting game that I assumed it was. Not that all fighting game based movies are bad. I could watch the first Mortal Kombat movie every day and not get tired of the heavy breathing required as I sing through the end credits theme song. And Machinima’s Mortal Kombat: Legacy web series was enjoyable. Whatever the series, whatever the reason, these characters come together to fight each other, and you, the player, gets to punch, punch, high kick, low kick, uppercut them to glory. In Injustice, the reason is simple: Superman’s gone a little crazy. More specifically, the Joker and Harley Quinn somehow managed to steal kryptonite, a submarine, fear toxin, a nuclear bomb, and the newly pregnant Lois Lane. Stir those together and you get a Superman who unknowingly kills his wife and unborn child, whose absent heartbeats then trigger the destruction of Metropolis. Batman believes that even this is not enough to corrupt the incorruptible Superman, buuuuut he might be wrong. So … we’re not going to negotiate? The game takes place about five years after this event. Prior to playing, I decided to read the first volume of the graphic novel, detailing the rise of Superman’s new regime, One Earth. With the murder of Joker, Superman takes justice into his own hands. No government is safe from his judgment. He refuses to accept the death of innocents, even if their death is for the “greater good,” and has zero tolerance for anyone who disagrees, including his Justice League comrades. The comic goes into surprising depth, taking the time to really get to the heart of each character’s reasons for joining or resisting Superman’s regime. Wonder Woman encourages him, believing that saving humans from themselves is what they, as super powered beings, should be doing. Ares isn’t happy with their plans because Superman’s imposed peace gives the God of War nothing to do. I particularly enjoyed Harley Quinn in this comic. She is always a favourite character for me, and this does her a lot of justice. She is still the goofy girl, utterly smitten with an abusive lover, but Taylor doesn’t forget that she is also incredibly cunning and manipulative. It deals with her heartbreak over Joker’s death, but, as it paves the way for the game’s Harleen, who works with Batman, we are reminded that she is woman who is far more than just Joker’s girlfriend. I’ve seen critics argue that some of the characters in the comic and game are out of sorts, especially Wonder Woman, who is okay with headbutting a tank full of soldiers just following orders, and also seems to be highly motivated by her desire for Superman. Returning to the game, we’re reminded that this isn’t necessarily our Wonder Woman. That is, we’ve got some alternate universe options going on. I’m not trying to replace Lois, Clark, I swear. But did you notice my new dress? When the game starts, Batman, Hawkgirl, Green Lantern, Green Arrow, and Wonder Woman are battling a few villains, including the Joker. Before the Joker can set off a nuclear bomb – because these are apparently readily available – everyone is pulled into the One Earth alternate universe, thereby justifying the need for everyone — heroes and villains — to fight each other. You start the game as Batman, of course, but once the universe switch happens, things start to get really interesting. In this alternate Metropolis, Batman is public enemy number one. When the authorities arrive, Batman is forced to flee, leaving Joker to his whims. This is where I stopped watching the YouTube video and bought the game. In the initial tutorial, you play as Batman and learn all his fancy fighting movies, but as the story progresses, the point of view changes to different characters. Normally in fighting games, you choose your favourite character and proceed, usually bound to this over-arching tournament concept to justify your character fighting everyone else. 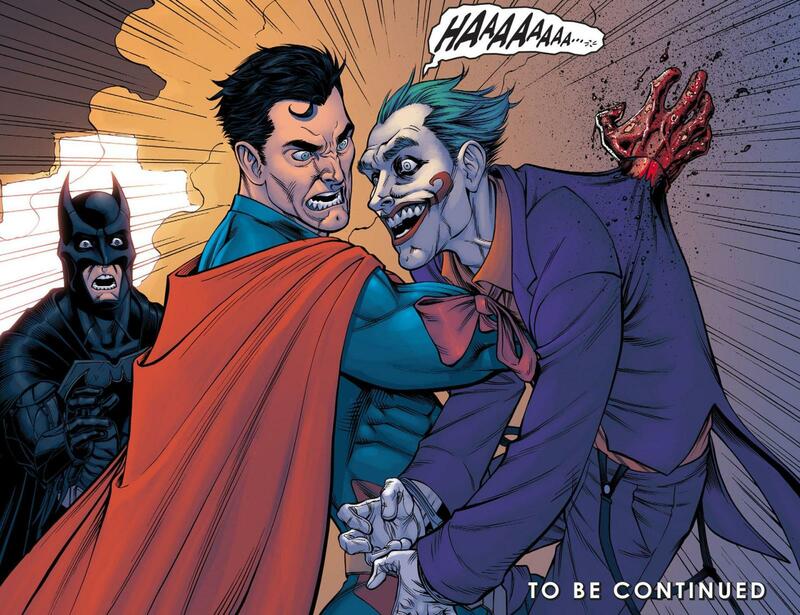 In Injustice, after Batman is removed from the picture, the player gains control over the Joker. He meets this universe’s Harleen, who is none too pleased with this imposter. Almost every character that you play gets to face off with their doppleganger. It’s amusing to see no one really perturbed by the fact that there are doppelgangers in the first place. It’s just taken for granted that alternate universes exist. Wonder Woman fighting Wonder Woman? Oh, it must be Tuesday. Story mode doesn’t take long to play and isn’t all that challenging compared to the straight battle game play options. There are different modes that allow you to explore the fighting styles of many other characters. There are mission based fights, challenge maps, and online tournaments, as well as a downloadable iTunes app for even more battle royale goodness. Every character has unique moves you can learn, as well as epic and amusing supermoves that you can use when powered up. My focus was only on the story mode, and in that, I was not disappointed. Especially since I bought the game for cheap during a Steam sale. It has the right amount of snark and heart that I’ve come to appreciate in the Justice League cartoons, punctuated by the kind of game play that left me nostalgic for my arcade days. The most epic game of Simon Says ever. It isn’t the most epic Justice League story ever, but it was an adequate twist on the fighting game genre that I used to love. If you’re a Justice League fan and a fan of fighting games, Injustice: Gods Among Us can hold its own against the other big names in the genre. But if you’re a Justice League fan looking for an interesting story, but maybe aren’t so great at the button mashing? Then this game works for you too.